Find here some of the typical Croatian dishes you must try during your vacation in Croatia. 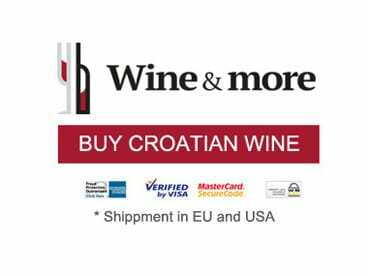 You will find these specialties on the menu of most of the restaurants of the coast, of the islands and in continental Croatia. In Croatian we say Pršut (pronounce pur-shoot). 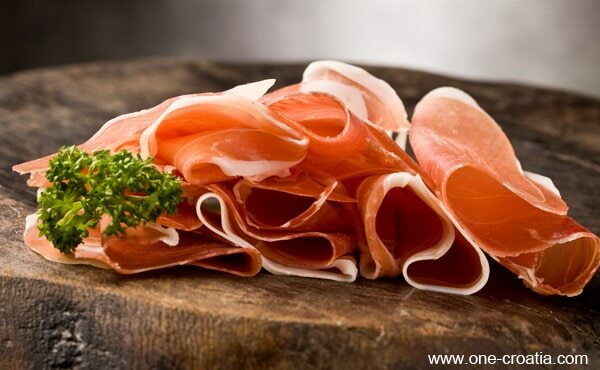 The smoked ham is served as an appetizer in all the restaurants of Croatia but the quality really depends of the restaurant. About 60-70 kn (9 euros). The most famous cheese of Croatia is called Paški sir (pronounce pash-key-seer). It means Cheese from Pag. It’s a hard cheese made from sheep’s milk. This sheep cheese can be produced only on the island of Pag. 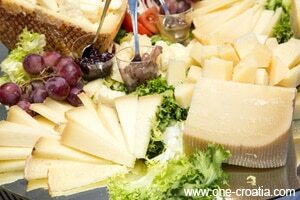 Like every cheese in Croatia, it is served as an appetizer. About 50-60 kn (7 €). The octopus is very present in the Croatian Adriatic Sea. 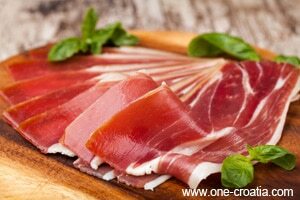 Therefore it’s very usual to find it in the Croatian gastronomy. One of the most famous dishes is the octopus salad, we find it on the menu of the restaurants on the coast and the islands. 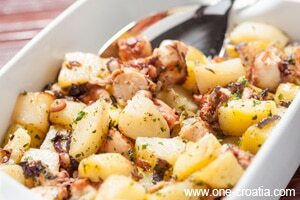 It is a cold salad of octopus, for the other ingredients it depends of the restaurant but usually it’s made with potatoes, tomatoes, capers, and of course some olive oil. This is a speciality coming from the region around Zagreb called Zagorje, so you will not find it everywhere but only in continental Croatia. 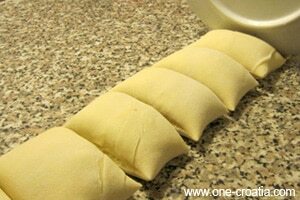 Štrukli sa sirom (pronounce chtroo-kli-sa-seer-om) are dough filled with fresh cheese, then they are baked with cream. This is a comfort food that really suits this region where winters are cold and snowy. About 40-50 kn (6 €). 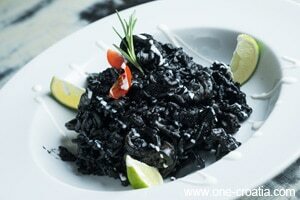 Crni rižot is a risotto made with cuttlefish where its ink gives this color to the rice. Its a very popular dish on the islands and on the coast. Many restaurants will rather use sachets of ink instead of fresh one, but still it is a very tasty dish that you must try during your vacation in Croatia. About 70-80 kn (10 €). Sarma are made from sauerkraut leaves stuffed with minced meat and rice. It’s a very famous dish all over Croatia. You cannot leave the country without trying Sarma. I really mean it, this is a must try!. About 40 kn (6 €). 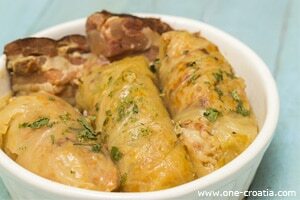 Find here the recipe for Sarma. Punjene paprike are bell peppers stuffed with minced meat and rice. 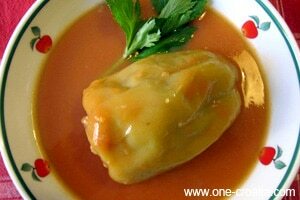 The recipe is similar to the one of Sarma, except that we use bell peppers instead of sauerkraut leaves. I couldn’t say which one is the best, better try both! Find here the recipe for stuffed bell peppers. 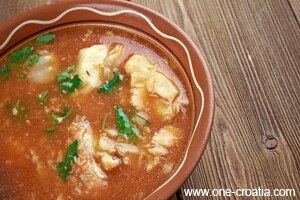 This Croatian speciality is made from different types of fish. The fish is cooked in white wine and sometimes with tomatoes. It is usually served with polenta. Price depending on the fish. You cannot spend your vacation in Croatia and not taste the calamari! 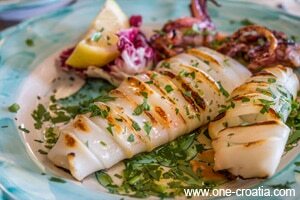 Squids from the Adriatic sea is one of the best thing I tried in Croatia. 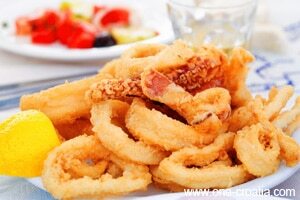 Unfortunately restaurants rather buy imported calamari because they are must cheaper than the Croatian one. Anyway, just grilled on the barbecue, it still a fantastic dish!. About 80-90 kn (11 €). Let’s take a minute here, and think about the person who had this fantastic idea to fry calamari. I just want to say thank you! Fried calamari are such a great dish, kids love them, everybody loves them. And when you think that they are served with french fries and tartar sauce… cannot get better than this! The diet can wait another day. Čevapi are pieces of grilled ground meat. You will find this typical dish in most restaurants in the country, but you must taste the sandwich with Čevapi, that you will find in fast-food restaurants. It is served with onions and Ajvar (sauce made from bell peppers) or with Kajmak cheese. This is THE sandwich you have to try during your vacation. And of course you must try both versions! About 30-40 kn (5 €). Pljeskavica is a typical Croatian dish made with minced and grilled meat. It is very often stuffed with cheese, in this case we call it Pljeskavica sa sirom. It is usually served with french fries and Ajvar (sauce made from bell peppers). Kids love it! About 60-70 kn (9 €). Peka is an iron bell that gave its name to this dish. 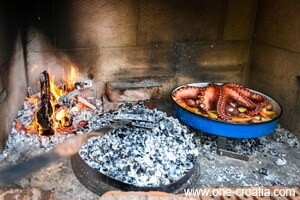 For this speciality we usually choose octopus and potatoes, or veal and potatoes that we place in a flat round tray. We put the iron bell on the top of it, place it in a fireplace and leave it for hours under the embers. Croatian are very fond of this specialty. You’ll find this typical dish in restaurants that own a fireplace but usually you have to order it in advance. About 220-240 kn (30 €) for 2 persons.